An employment application form, or job application form, is a document that allows people to apply for a job with your company. It gathers information about the candidate, such as their name and work experience. A good employment application form may even help job seekers self-determine whether they’re qualified to work at your company or not. In this article, we’ll provide a free job application form template for you to use and tell you what to include and avoid mentioning in your form. 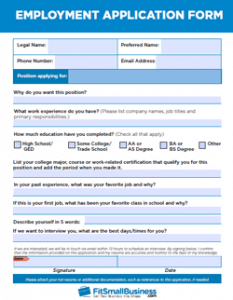 Here is a free one-page employment application form template you can use for screening job applicants. You can download and print it out to hand to walk-in job seekers. This sample job application is a good starting point and can be adapted for your business by adding additional sections and questions. Download the employment application template as a PDF or DOC. The purpose of the employment application form is to gather basic information about each candidate and help you determine which candidates you’d like to move further along in the hiring process. The chart below shows what we recommend including in your job application form. We also include information that it’s best not to ask on the employment application form or during the interview process, along with the reasons why. For example, some questions risk that the information gathered may violate federal labor laws, anti-discrimination laws like Title VII of the Civil Rights Act of 1964, age discrimination laws like the Age Discrimination in Employment Act of 1967 (ADEA) or Health Insurance Portability and Accountability Act of 1996 (HIPAA) laws, which protect a person’s confidential health-related information. The main thing to keep in mind when creating an employment application form is to ask targeted questions that give you a keen understanding of the value a job candidate can bring to your company. Stick to questions about job performance, work experience and behavior. The employment application questions below will help you to identify interpersonal traits, such as communication skills, thoughtfulness, motives and the candidate’s ability to work collaboratively. Answers to two or three of these kinds of questions can give you a good sense of who the job seeker really is, beyond skills. They help you determine whether the job applicant will be a good fit for the role and your company culture. Here are 20 questions to choose from that you may want to ask on your job application form. How many hours can you work weekly and what shifts are you available? Are you able to commute to our location in a reasonable amount of time? What were your best accomplishments in your last role? Describe when you had to make a tough choice. What did you have to choose between and why did you choose it? Provide a detailed example of a time you demonstrated leadership. Describe your relationship with your last immediate supervisor. What would your most recent supervisor have to say about you? Why did you move on, or why are you looking to move on, from your most recent position? What accomplishment are you most proud of in your personal or professional life? Provide a short list of your personal strengths (they do not have to be job-related). Describe how you are able to overcome your top three weaknesses. Provide a one- or two-sentence glimpse of your primary career goal. If money were no object, what would you do as your career? While you don’t want to scare away applicants or make your application form unduly long, you do want to include up to five questions from the list. If you’re thinking some of these questions are better saved for the interview, you’re not wrong. However, asking a few of these on the employment application form may save you from having to interview the person at all. Think of it as “pre-screening.” It just saves time by getting you to more qualified candidates faster, as poor candidates will expose themselves with answers like, “I don’t know”. If an applicant isn’t willing to provide five short answers on an application, do you think they will make a good employee? Probably not. On a job application form, you want to avoid five types of questions that can cause legal headaches and that waste time. Some of these are risky based on federal law. Questions about protected characteristics, such as race, age, gender and religion. You should avoid these questions because they relate to Title VII of the Civil Rights Act, which affects all employers with more than 15 employees. Questions about race, gender or marital status can reveal if someone is a member of a protected class and cause unintentional bias on your part. Questions about age violate the ADEA. Questions about confidential information like medical conditions, Social Security numbers, I-9 and tax status. Some questions around confidential information like Social Security numbers and tax status can be asked either after hiring or, if necessary, as a condition of the offer (like passing a background screen or credit check). Medical, pregnancy and disability information remains private due to HIPAA laws, the Pregnancy Discrimination Act and the ADA — to prevent discriminating against a disabled person. They should never be asked about on a job application form. Questions about salary history may cause you to subconsciously offer a female or minority less pay than other employees in the same role. It’s OK to ask what kind of salary or pay range the applicant is seeking but, due to recent legal changes in many states, it can be risky to ask questions about the applicant’s prior salary history. In addition, your unconscious bias may cause you to eliminate good candidates thinking either that they made too much at their last job or that they’ve only held lower paying jobs — even if they have the right skills for your position. In a nutshell, you should pay a candidate based on your job requirements, not the prior salary he or she earned. Questions about criminal background. Some states are cracking down on employers who ask questions like “have you ever been arrested?” Others have banned the box asking if an applicant has been convicted of a felony. Questions that won’t help you determine if an applicant is a good fit for the job, which wastes the applicant’s and your time — such as “If you were an animal, what kind of animal would you be and why?” Avoid unnecessary questions by having a team member, your human resources representative or the manager of the team read the application form. Does everything matter to the role? Is anything extraneous? Are there any nonsense questions you should eliminate? Should All Businesses Have An Employment Application Form? If you have walk-in clientele, then it’s a good idea to have a simple one-page employment application form because you’ll surely have walk-in job seekers. For example, restaurants, clothing stores, cafes, daycares and other brick-and-mortar businesses often have people pounding down their doors to see if they are hiring. You’ll want something for them to fill out and give back to you. If you are primarily online or in an industry where clients do not walk into your office, you may not need an application form. In that case, candidates will likely submit resumes with cover letters via email, your website, or an online job posting site. If you need to post your job online, consider using Indeed, our recommended job site for small businesses to find hourly workers. A job application form is handy if you get a blind solicitation from a job seeker, such as by email, and want to give them an employment application form to fill out. This is helpful when you don’t have a job opening at the moment but want to gather their information in case something opens up. You can send them a PDF link to your form via email. Depending on your type of business, the job application can be a way to not just find great talent that matches what you need but also serves to create an on-demand pipeline if someone resigns, walks out or is fired. You then have a list of names with emails and phone numbers to call, eliminating last-minute panic. Save your completed job applications in a simple way. Three folders are all you need — rejected, hired and currently in the pipeline. Organize the applications within each folder by date, most recent first. In most states, you must retain job application forms for at least one year. Once an applicant has been hired, is older than age 40 or in a protected class, two years may be safer. Here’s what SHRM recommends. Of course, why keep all that paper when you can organize applicants digitally in an applicant tracking system, like Freshteam. Disclaimer: FitSmallBusiness provides education, templates and information. To be safe, have your attorney view your employment application and job application retention needs to ensure your business is compliant with all federal, state and local requirements. Once you have your employment application form created and approved, start using it. Add it to your ‘we’re hiring’ page on your website or print copies and leave them on your service counter. You’ll probably find that you not only get better applicant information from candidates that meet your business needs but you’ll have a tool you can use when you’re out and about and just happen to stumble upon someone you’d like to hire. Just hand them a job application or get their email so you can send them one. Once your applications start rolling in, consider using the free version of Freshteam’s applicant tracking system to keep track of those candidates. Many company websites are difficult to navigate, especially when you’re applying for a job online. You may want to follow up by contacting the HR person and emailing a copy of your resume to them directly. Best of luck to you. issue. I like all oof the points you made. Screening candidates from the start really helps prevent hiring mistakes and lets you find the best of the best to work for you! I am looking for some type of way to have potential new employee fill out online applications on our website or a 3rd party. What programs or website offer such services? Hi Kevin, Thank you for reading and commenting. A number of applicant tracking or recruitment software systems have application forms that you can customize. We have a buyer’s guide on each kind of software if you want suggestions. You also could create a Google Form or use a 3rd party application service like Wufoo. Good luck! Hi..I have a small painting and wallpaper business where I am entrusted in peoples’ private homes..I have been hiring guys for years without really knowing much about them..I have a very good reputation..but I have to say, if a worker ripped off a client, I sometimes wouldnt even know where to find him..cant I ask for their addresses on a job application?and ID for a background check? Hi Stephen, Thank you for reading & for your question. Both a worker’s address and a copy of their ID are things that you can get once you have hired the employee. If you have hired someone, then yes, you can ask for these things. Also, if you do a background check, they need to fill out a consent form prior to you executing one. I hope this helps and good luck! Fit Small Business is not an attorney, and we cannot provide any legal advice. However, here’s some general information in response to your comment. We recommend contacting an attorney if you have further questions. Although it is a privacy concern, employers are permitted to ask for your social security number on a job application. They may use the SSN to conduct a background check or for other other legitimate purposes. However, we do recommend that employers securely store any documents containing SSNs to protect the privacy of job applicants. As for race and age, there’s nothing explicitly illegal about asking for these items on a job application. It’s how the employer uses the information that’s important. For instance, if the employer uses racial data simply for government reporting purposes, that would be ok. Prescreening applicants based on race would not be ok. Same goes for age. It’s generally a good idea for employers to separate out questions on demographics such as age, race, and gender from the actual job application so as to prevent any bias or later legal claims of discrimination. Please consult an attorney if you have further questions.